A while ago, I was browsing through Boris Vallejo and Julie Bell’s website, Imaginistix. They have lots of art prints for sale and even original paintings for sale. I searched for Star Control and I was lucky to discover prints for the Star Control painting are for sale and I decided to order one. I have finally received it in the mail. Accolade ported some of their games to the Sega Genesis, including Star Control. Included with the game was a form that could be mailed out to order a Star Control poster of Boris Vallejo’s artwork for the game. 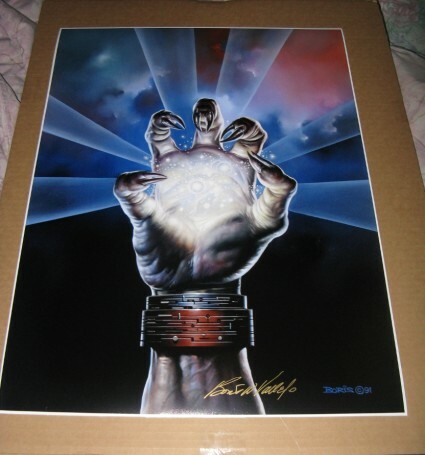 While the poster for the Genesis version is virtually impossible to find, buying a print of his painting from the Imaginistix website is a great alternative for anyone willing to pay for it. Did you know that Paul and Fred were not told who was working on the cover art for the Genesis ports? Boris and Julie still create art for movies and video games to this day. I bought the largest print (18 x 24), which cost $150 USD plus shipping. It was shipped via USPS Priority Mail, which may vary in delivery time depending on its destination. There are also other sizes available: 8 x 10 ($30), 11 x 14 ($50), and 12 x 18 ($70) in addition to 18 x 24. It is a great quality image printed on photo paper; it is glossy with a matte finish. It was shipped in a flat cardboard box, with the print sandwiched in layers of additional cardboard to keep it flat. Each Star Control print has a signature from Boris Vallejo himself. I am aware that this may be considered expensive for an art print like this. Keep in mind, this is being purchased directly from Boris Vallejo’s site and it is supporting his work. I do not consider myself an art collector by any means and it’s definitely worth buying for anyone who wants to add something new to their Star Control collection. I could not find the original painting on the site and I doubt I’d be able to afford it considering the prices of other original paintings on the site. I plan on buying a frame for this and hanging it on my wall. I have a copy of the giveaway poster. It is in good condition. Do you think it is worth having restored? It depends on what they're charging, if it's a professional restorer. 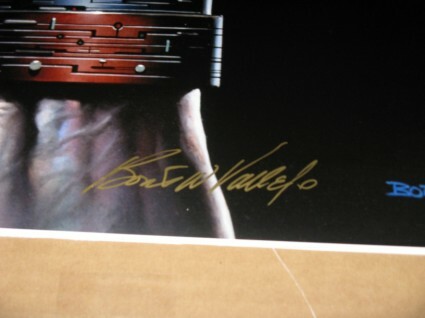 It might be cheaper to buy a photo print from Boris Vallejo.